The 466 MHz model included a 6x DVD-ROM drive, and weighed 6.8 Lbs. With the September 2000 announcement of the iBook (FireWire), Apple finally brought FireWire to its entire product line. It also introduced an innovative new combination video/audio out port (a standard miniplug), which allowed consumers to watch their iMovies (or their DVDs on the SE version) on their TV. 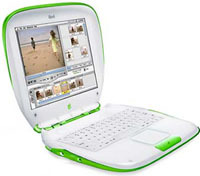 The iBook (FireWire) was available in two configurations: a 366 MHz model, with 64 MB of RAM cost $1499 and was available in Indigo or Key Lime. The 466 MHz "Special Edition" iBook came with a DVD-ROM drive, and was available in Graphite or Key Lime for $1799.